Far Cry 2 is an open-ended first-person shooter developed by Ubisoft Montreal and published by Ubisoft. It was released on October 21, 2008 in North America and on October 23, 2008 in Europe and Australia. Crytek, the developers of the original game, were not involved in the development of Far Cry 2. Ubisoft has marketed Far Cry 2 as the true sequel to Far Cry, though the sequel has very few noticeable similarities to the original game. Instead, it features completely new characters and setting, as well as a new style of gameplay that allows the player greater freedom to explore different African landscapes such as deserts, jungles, and savannas. The game takes place in a fictional modern-day East African nation in a state of anarchy and civil war. The player takes control of a mercenary on a lengthy journey to locate and assassinate "The Jackal," a notorious arms dealer. Around the time of the game's release, the second of two Far Cry novels was published in Germany, authored by Michael Bhatty, the former Lead Game Designer of Sacred. 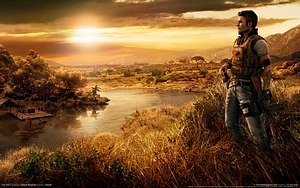 The first novel primarily tells the story of the first game, and also features the sequel's Marty Alencar as a character, as well as including a flashback scene taking place in Far Cry 2's African setting. The second novel acts as a prequel of sorts to the game, with the plot focusing on Paula, a war veteran-turned-mercenary, and her struggle in the diamond conflicts and civil war which are the focus of Far Cry 2. Both of these novels feature a character not seen in either game called Zaman, a former Asian American CIA agent who acts as a trainer and mentor to both Paula and Jack Carver.